I know I've said it before, and will probably say it again before too long. This section was never really rust busted properly, as it was part of that steep learning curve in the beginning, so it needs re-doing almost exactly three years later. This is all part of a grand plan to re-paint all the bits that I've already painted, sort of a maintenance job more than anything. Ah well. The more I do now, the less there is to do on the re-paint next year I suppose. Painting the various engine systems is no trivial task. Here I've just finished rust busting and cleaning up the outside of the intercooler, ready for painting. In some ways, this is also a continuation of the intercooler project. Next will be to get a coat or two of primer on, in preparation for the finishing coat. I've opted for a kind of light blue for Lady Jane's compressed air systems, including the compressed air from the turbo, which will replace most of the blue you can see in the picture there. Although I've not made a final decision, I'm tending towards cream for the main engine and other machinery. 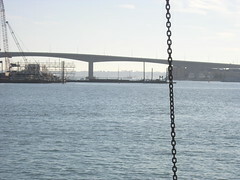 This is the Wyetow, from Itchen Marine, as she chugs back down the river past Lady Jane. 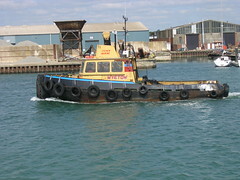 These tugs can often be seen chugging about Southampton water as they go about their various duties. 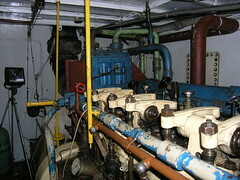 This picture shows what a stark difference a lick of white paint inside the engine room is having. Fred has been diligently working at brightening up the place for some time now. Things seem so much more pleasant as the paint spreads around the walls there. 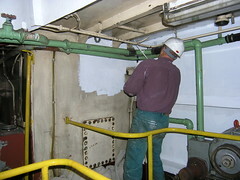 I am so looking forward to all the insides of the engine room being painted. The trouble is, as I'm discovering, now I have to keep the place clean as I work down there. The first system to get to grips with on Lady Jane is the 240V AC mains. I have learned that the first thing I need for electric stuff is a big space to put everything. For some reason electric bits and pieces always seem to take more room than is available. Here you see Andy fussing over the last of the wiring into the main consumer unit. That is the result of two days solid work there. At the core of my new system is an automatic switch from Sterling Power. The switch enables me to automatically route power from any one of the donkey, deck generators (or shore power), or inverter, to the mains consumer unit. The cool thing about the switch is that it can automatically shut off power to my battery charger if the power is coming from the inverter, for obvious reasons. The mains consumer unit then acts as the distribution point for mains power through the rest of the boat. Overall, the new arrangement means that the 240V power source is only indirectly connected to the various devices that use them, which means that my reliance on extension leads to get power to various parts of the boat should now start to disappear. At last - no more forgetting to change the fridge back over to the inverter after shutting off the generator! 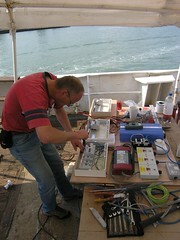 Boat electrics - what a huge task. Here you see the space where the newly sorted systems are destined to go, after removing the bodge that I've had to date. Actually, this project had started some months before, with a lot of discussion and planning. 24 Volts DC boat systems - nav lights, domestic lights etc. 12 Volts DC boat systems - for which there is no 24 volt equivalent - radios etc. I am not planning on touching the 110 volt DC system, as I will upgrade the equipment to 240V AC as and when the 110V stuff dies on me (hopefully never). The 12V system is effectively a battery, one switch and a few wires, so that should not be a problem to set up. The 240V AC system is not so easy, as I've got extension leads, generators and inverters all over the place to get a grip on. The worst system to get a grip on will be the 24V system. 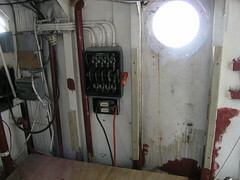 This is already wired throughout the boat, as you can see by the big Frankenstein switch. All the switches and other equipment need modernising, as the original 24V generators which ran off the main and donkey engines are now effectively redundant. Anyway, the first system under the knife, as it were, is the 240V system, simply because this is out of control at the moment and is the most likely to be the cause of an accident if left to fester for much longer. What a busy weekend it's been. You know how sometimes things go so fast it's all a bit of a blur? The folks at the marina where I keep my rib must have been wondering somewhat at the fetching and carrying over the last few days. Among the regular visitors, Patch, Andy and Rob, I also had a new visitor to Lady Jane. The beautiful Nerina, a friend of Patch's. We all sat around on deck in the warm sunlight and scoffed pizza for lunch. Hmmm..
Yellow is not the only colour paint I've been slapping on. Here blue denotes fresh water, though not necessarily potable water. 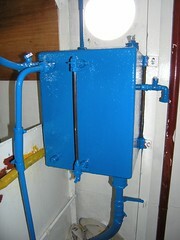 This is the header tank for the main engine cooling system, along with it's associated pipework. Fresh water is run through the engine, as opposed to salt water, so as to minimise the effects of corrosion inside the engine cooling system. Here you can see my progress with painting the handrails. 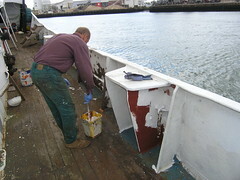 I tried buying orange paint, but when I opened the tin on the boat the paint was yellow. This type of paint needs two, or more, coats so I thought I'd at least make a start with the yellow, then do the subsequent coat(s) in orange. The rest of the yellow paint I have I can use on the oil pipes when I paint them. 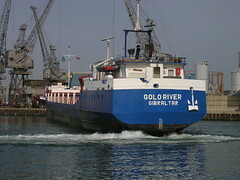 Here is the Golo River, departing from immediately opposite where Lady Jane is moored on the River Itchen. What is unusual about this picture is that the Golo River's bow thruster was obviously not working, so she used the quay side to push against while manoeuvring to turn. Although there was some crunching noises going on, it did the trick. I'll bet the skipper wasn't feeling too good about it though. 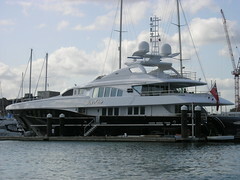 I saw this at Ocean Village Marina, on the River Itchen, Southampton. I'm pretty sure that if I had such a boat I'd be pretty bored - nothing to really get stuck into. It would be fun for a while though - all those cool gadgets it is obviously dripping with. No matter what else is going on, there is always painting to do. The great thing about painting is that a relatively small amount of effort produces big returns in how the place looks. Even if it's only a coat of primer. I know there is tons of work in the preparation of the things to be painted, but only if things have been let to get in an awful state in the first place. 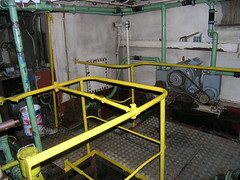 My plan for the engine room is to pick a system, clean it up then paint it. Here you see I've got primer onto the hand rails above the engine room. 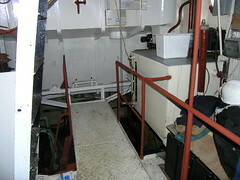 The rails down in the engine room have also been done. My thinking is I'd start with something simple, then go on from there.